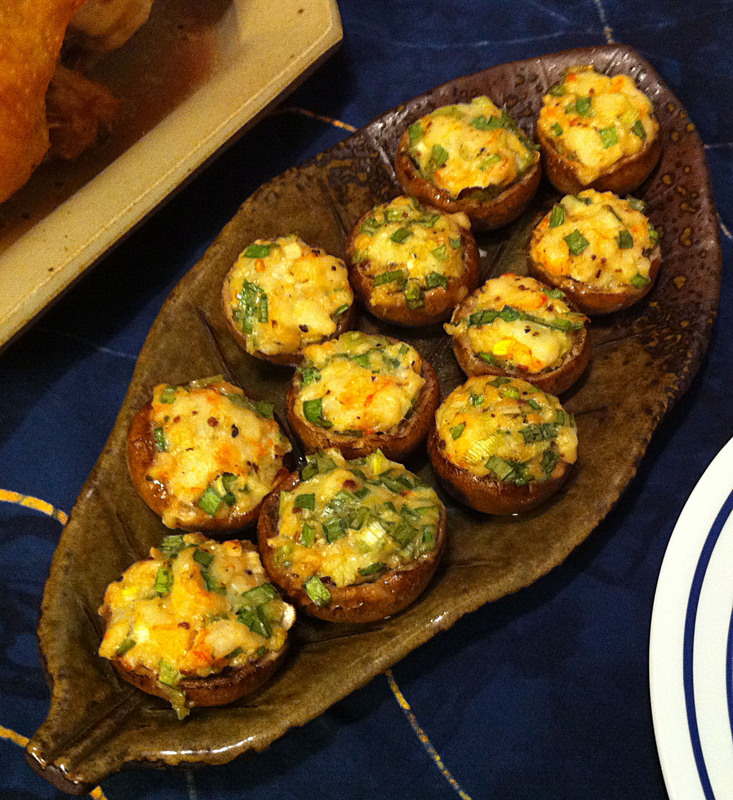 Myr and Chris really like stuffed mushrooms and they really liked my Szechuan salt and pepper shrimp. The solution was too obvious. My Szechuan shrimp is really a simple recipe, so I could not help but doctor it up as a stuffing. 1. Pour one teaspoon of sesame oil into a small cup. 2. Trim the mushrooms. Gently scoop out the vanes, if necessary. 3. Dip your finger into the sesame oil and run it around the inside of the mushroom cap. Tip: This both adds flavor and prevents the freshly scraped mushroom from oxidizing (turning brown). 4. Add two teaspoons of peanut oil to the remaining sesame oil in the cup. 5. Quickly dip each mushroom and coat the outside of each with a thin coat of oil. Tip: You may also do this by brushing the oil on with a pastry brush. 6. If necessary, peel and devein the shrimp. Mince it finely and put it in a small mixing bowl. 7. Add one teaspoon dark sesame oil, one teaspoon peanut oil, minced green onions, grated ginger, Szechuan Salt & Pepper, shaoxing, and the black vinegar.